“How much water does an outdoor waterpark use?” I am frequently asked that question, but the answer isn’t as simple as it seems. Calculations for outdoor waterparks are heavily dependent on factors that simply don’t apply to their indoor counterparts, namely those related to climate and the environment. There is no way around it – outdoor waterparks require large amounts of water. Public perception often assumes that the outdoor waterpark is constantly being refilled with a giant spigot that is tapping the community’s water supply, which may be at a premium. Water use, however, is not water consumption. Facilities that practice proactive water conservation can save water and improve their bottom line, while refuting the perception that waterparks are wasteful and the industry is indifferent to the plight of drought-stricken areas. Before tackling water conservation, it’s important to note the difference between water consumption and water use. These two basic concepts are completely different and are not interchangeable. Physical attributes. Waterpark size, design and attractions all affect water consumption. How a visitor enters a receiving pool (if one exists) after a slide experience or the area of a deck apron and its slope draining water back to the pool all factor in the ability of the waterpark to reclaim water and reduce water consumption. Splash or spray-type attractions with larger surface areas are more subject to evaporation or water consumption than an attraction that is primarily a body of water, such as a lazy river or wave pool. Climate. The average weather pattern in a given area over a period of time includes precipitation, humidity, wind speeds, temperature, etc., which all impact water consumption. Water loss through evaporation is higher at an outdoor waterpark than in an indoor waterpark’s more controlled environment. A metric for identifying water consumption is the consumption ratio, which is the amount of water consumed divided by the overall water used on a daily basis. Water Use is the collective amount of water within the attraction’s water system. The initial fill of a waterpark creates a body of water for visitor use. This body of water is considered similar to an amusement park’s rollercoaster. Both attractions exist to be used as entertainment by their visitors. As both attractions are being used, both need to be maintained. Water conservation is the process of reducing the ratio of water consumption to water use, defined as the consumption ratio. Lower ratios equate to more successful water conservation efforts. In this example, approximately one-half of one percent of the total water in this facility is being consumed on a daily basis. For further analysis, a comparison can be made for a specific location utilizing US Geological Survey water use figures (waterdata.usgs.gov). The 3,000 gallons of top-off water per day in our example is equivalent to the amount of water that approximately 50 people consume daily in that location. When all the data is present, an analysis of water consumption can be prepared that informs the operator of their waterpark’s efficiency of water use. The challenge, especially for outdoor waterparks, is that the consumption ratio at one waterpark cannot be directly compared to the consumption ratio at another waterpark, until and unless the variables of seasonality, climate, and other environmental factors are equal, and thus negated within the analysis. Part two of this article will illuminate this issue. Regenerative media filters (RMF) have increased water efficiency and produced cleaner water, while reducing both energy and water consumption. This technology is superior to DE (diatomaceous earth) filtration systems in terms of efficiency. Many of the older properties that we have researched indicate that they have or are going to switch out their old filtration system for a new RFM system, such as the Defender® Regenerative Media Filters by Neptune-Benson. Increased efficiency in system controls and monitoring allows facilities managers to more easily collect and analyze data, more quickly detect anomalies in water consumption, and take corrective action. This advanced technology, such as Neptune-Benson’s RMF System Controller also allow for remote and even mobile monitoring by multiple individuals. This is a far cry from the manual input associated with daily logs. 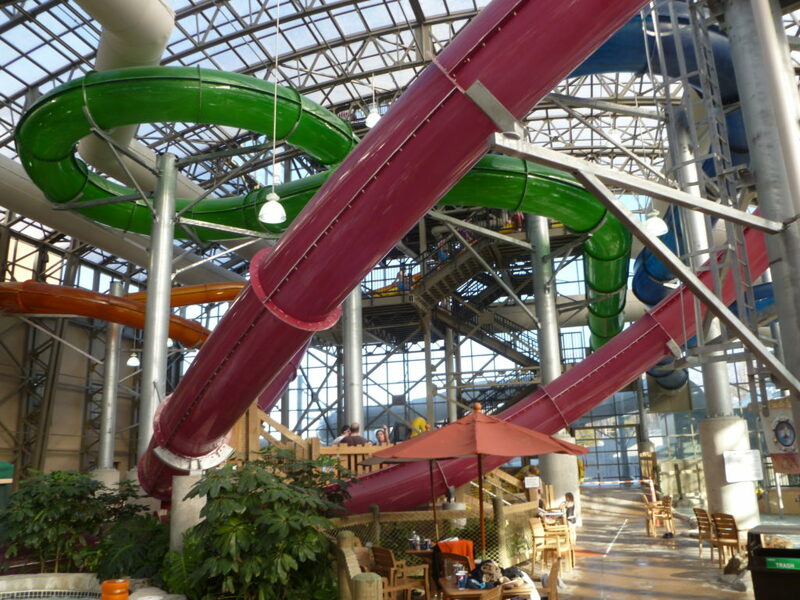 This innovation is assisting the operator to fine-tune the waterpark’s filtration system. In addition to water system technology advances, slide designers are introducing new waterpark attractions that require less water consumption. Even something as simple as providing splash guards on slide exits reduces water consumption and increases water use efficiency. Fiberglass flume profiles are engineered with safety and entertainment value in mind, which also benefit water conservation efforts. New facilities can be designed with these efficiencies, and existing facilities can implement changes during the course of regular capital improvements. These innovations are a direct response by the industry to the water conservation question, proving sustainability is a concern and a priority for waterpark industry stakeholders. It is clear that the waterpark industry needs to do more than react to criticisms of water use and water consumption. I suggest letting the data speak. Next month in part two of this article, data for several outdoor waterparks in various locations around the country is analyzed for water consumption ratios. The article will discuss comparability and summarize key points for use in the industry’s ongoing dialogue regarding water conservation. For further consideration, what if the industry came together to produce a comprehensive study on water use and water consumption that would allow facilities to benchmark their water conservation efforts against industry standards? The value proposition of such a study is found in waterpark owners and operators taking proactive conservation steps that not only benefit the facility but also lead to goodwill within our communities. Is the industry willing to participate on a confidential level and share the data? I’d be happy to hear from any interested industry stakeholders regarding their opinions and participation in such a study. Eric B. Hansen, AIA, ISHC is Director of Development Services for Hotel & Leisure Advisors, a national hospitality consulting firm. Mr. Hansen performs appraisals, market feasibility studies, and economic impact studies for hotels, resorts, waterparks, golf courses, conference centers, sports facilities, and other leisure properties. As a hospitality consultant with a foundation in consulting, architecture, financial management, and appraisal theory, Mr. Hansen offers more than 20 years of experience to H&LA clients for their pre-development, consulting, and valuation needs. Contact him at 216-228-7000 x21 or ehansen@hladvisors.com. Learn more about H&LA at www.hladvisors.com.